Italy goalkeeper Gianluigi Buffon is to meet former South Africa president Nelson Mandela "to talk about peace". The Juventus stopper, who is taking part in his fourth World Cup, is a key member of the Get The Point initiative, which aims to persuade young people to keep away from gangs and violence. Buffon, who won the World Cup in 2006, said: "I've achieved many of my footballing dreams but this is the biggest on a personal level. 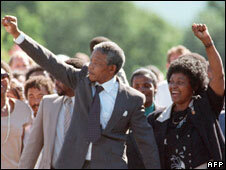 Mandela changed the history of a country and the whole of Africa." Hollywood film star Tom Cruise reckons David Beckham will play in the 2014 World Cup for England, in spite of the fact he will be almost 40. Beckham, 35, has been ruled out of this year's tournament with an Achilles tendon injury but Cruise is backing the midfielder to pull off a Mission Impossible to play in Brazil in four years. The pair became good friends after Beckham signed for Los Angeles Galaxy in 2007 and Cruise told The Sun: "I wish he was playing in the World Cup this year but he will be back for the next one you know." Australia coach Pim Verbeek is confident that Harry Kewell will be ready to play against Germany in their opening World Cup game on 13 June. The Galatasaray midfielder is lacking match practice having only played a few minutes in 2010. Kewell has been struggling with a groin injury and the former Liverpool and Leeds player did not feature in the Socceroo's 1-0 victory over Denmark on Tuesday. But Verbeek said: "Everybody who saw training saw that Harry was ready." New Zealand striker Chris Killen has postponed his honeymoon in favour of joining up with his team-mates for their first World Cup appearance since 1982. The Middlesbrough forward missed Saturday's shock 1-0 victory over Serbia in a pre-tournament warm-up to get married but has since rejoined the squad. "It was a great day and obviously it would have been nice to go straight on a honeymoon afterwards," said Killen. "The missus would have been a bit happy with that but she knows it's important for myself and my career that the World Cup is the focus now, so we've put it on hold until after. As soon as we're done here we'll be off." The All Whites' 1-0 win over a Serbia side ranked 15th in the world has raised hopes that they could win their point at the World Cup finals. They lost all three of their group games in their only other appearance in 1982, 5-2 to Scotland, 3-0 to Russia and 4-0 to Brazil. However, assistant coach Brian Turner is aware that the result could have done more harm than good. "It's probably fair to say we can't fly in under the radar after a performance like that," he said. "People will be much more aware of our strengths and probably be a bit better prepared when they do play us." Multiplex cinemas in South Korea will broadcast their team's World Cup matches live in 3-D in an attempt to lure supporters away from their televisions at home. Around 100 cinema screens across the country, which showed games for free in 2002 when South Korea co-hosted the World Cup with Japan, will be used - although fans will have to pay this time round. Shunsuke Nakamura is expected to take part in Japan's final World Cup warm-up game against Ivory Coast on Friday after recovering from an ankle injury. The 31-year-old midfielder missed Japan's 2-1 defeat by England in Austria on Sunday but came through a practice match against a local side in the Swiss Alps on Monday. Tottenham midfielder Giovani Dos Santos is considering quitting Mexico's World Cup squad following the omission of his brother Jonathan, according to the players' father. "Gio is very hurt and he wants to be at home with us," said his father Zizinho. "Jonathan told me that he is going to quit the Mexican team and I don't want him playing for them anymore anyway." Juventus defender Giorgio Chiellini completed his first pre-World Cup training session with Italy on Tuesday having shaken off a thigh problem which has kept him sidelined for one month. Italy are due to name their 23-man squad on Tuesday evening.